Esther wonders if Ma really loves her. Her best friend, Shirley, gets lots of hugs and smiles from her mother. But Esther’s mother seems to love Esther’s siblings more. She never hugs Esther. She rarely smiles. She seems to be preoccupied with “signs.” A ring around the moon means bad luck. A black cat crosses your path and you’re sure to have an accident…..and on and on. Esther comes home from school one day to find out Pa has lost his job. It is 1930 and many men are losing their jobs. When Pa decides to buy a farm in Wisconsin, Esther must say goodbye to Shirley and life in Chicago. The farm has no electricity or indoor toilet, but it does have a dog and horses. Soon, Esther settles into farm life and loves it. If only Ma loved her. 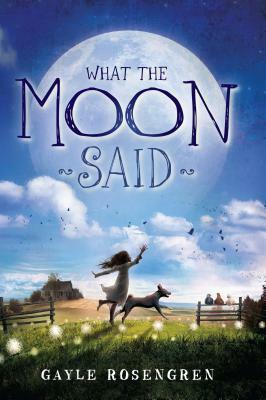 What the Moon Said explores the question: what does it mean to really love someone and how is that love demonstrated? Ma is not a demonstrative mother, and whatever Esther does to try to get a hug, it always turns out wrong. Eventually, Esther will learn that love comes in many forms, and actions do indeed speak louder than words. In this sensitive novel, Gayle Rosengren hits all the right notes, portraying the turbulent emotions of a young girl during a turbulent time in our history. I’m so excited to read Gayle’s debut novel. It’s long overdue. Gigantic ditto marks from me, on this, Steph. This is such a wonderful book and Gayle nags created a memorable character in Esther- and I have trouble remembering characters in detail! Great feature.